Improve your view without compromising security or comfort with a new Solace® Sliding Door. Built with big views and high performance in mind, your new sliding door has 1” thick tempered safety glass surrounded by a sculpted sash frame for added architectural detail. The structural three-point locking system is actuated with a simple turn of the knob or the use of a key for easy operation and even greater security. 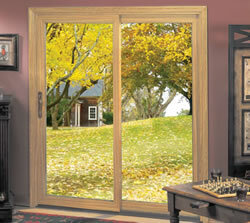 Every Solace® Sliding Door has a concealed three-point locking system that is recessed in the door panel. Three locks simultaneously engage into the keepers in the door jamb when the door is closed. Solace® Sliding Doors also are available in configurations up to 12 feet wide where the center section slides and the two end sections are stationary. Lifetime Finish brass handle reduces chance of tarnishing and pitting. Three-point locking system for added security and peace of mind. Optional combination ventilation and dead bolt foot lock for improved security. Quad seal weather-stripping provides added maximum resistance to air and water infiltration. Top hung screen provides smooth trouble free operation with no hang-ups. Twin tandem oversized 1 1/2” diameter steel rolling system for undisturbed operation.